Published on December 29, 2009 in Bands/Artists, Eastern Iowa, Media, Music, Out and About, Personal History and Reviews. 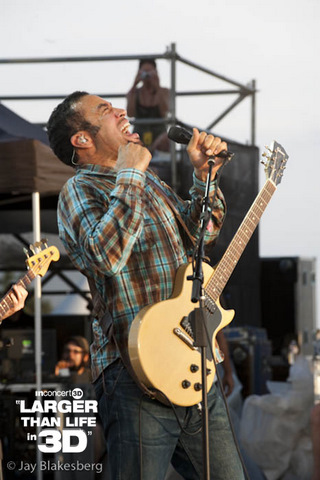 0 Comments Tags: 3D, ACL, All Points West Festival, Ben Harper, Ben Harper and the Relentless7, concert, Dave Matthews Band, DMB, Gogol Bordello, Live, Lollapalooza, Movie, review, show. 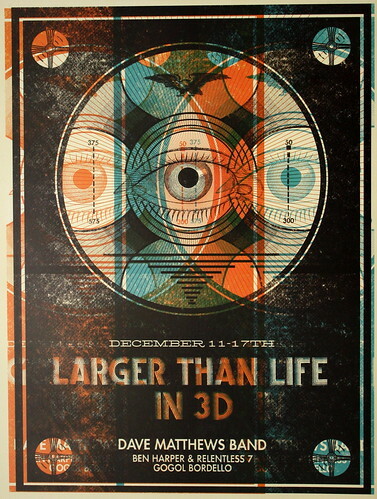 As I previously posted, movie theaters across the nation had a new live concert film/experience titled “Larger Than Life in 3D” which featured Dave Matthews Band, Ben Harper and the Relentless 7 and Gogol Bordello which showed from December 11th through the 17th. I attended the 9PM showing on Wednesday, December 16th at the Wehrenberg Theater in Cedar Rapids. 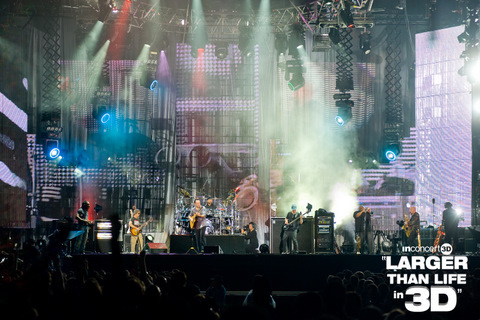 The movie was a 3D experience of three 2009 concerts with each of the bands. I haven’t heard any reports about attendance of the showings, but the dark theater was empty– an exclusive showing for me, apparently. Maybe the fans of these bands had seen earlier shows, maybe it was a factor of folks out for Christmas shopping. Unfortunately, I was planning to give away some teeshirts, posters and lanyards promoting the event, but ended up bringing the pile back home with me. I did give away a couple teeshirts anyway. I think that this is a pretty cool event idea and the 3D and surround aspects of seeing a live act, while not the same as experiencing a live show with the crowd is very much enhanced over just seeing a video or even just a movie of a concert. The movie kicked off with short sets from Gogol Bordello and Ben Harper. I haven’t seen either of them live– video or otherwise, so I was interested to see them. Before the movie started there were previews of some upcoming 3D movies– a cute preview to the new addition to the Toy Story series which should be out in 2010. The Spanish-language Buzz Lightyear had me laughing out loud– looks cute. I also saw the preview for the new Tim Burton film Alice in Wonderland, which is apparently a sequel of sorts to the original story with an adult-ish Alice returning to Wonderland. In addition to those trailers I saw a trailer for another 3D concert movie from the folks at inconcert3d– in February there will be a “Best of Lollapalooza” movie which looks cool, and the trailer dropped that there will be a “Best of Austin City Limits Festival” in 2010 at an unspecified date. I’m sure that the ACL Festival footage came from the same shows that provided the footage for the Dave Matthews Band set. Following the trailers they showed Alberta Cross performing “Old Man Chicago” from the Livestrong stage at Austin City Limits festival. I hadn’t heard them before, but had heard of them from their Daytrotter.com session (click here). First up was a short but high-energy set from Gogol Bordello. The two songs performed were effectively the last two songs before the encore of their nine-song performance at the All-Points West Festival in Jersey City, NJ from August from this year. Pretty crazy set– the band played in a frenzy. Very Eastern-European folk rhythms. I thought it sounded pretty great, but I think it would have been better if the set would have been more than two songs and actually at the show. Following Gogol Bordello was a three-song set from Ben Harper and the Relentless7 excerpted from their performance at the Mile High Festival this year. I was really impressed with their set. Ben Harper was on fire laying out his bluesy approach which reminded me of Lenny Kravitz and Jimi Hendrix a bit. I really wish there would have been more Ben Harper! His set was enough for me to download his new album White Lies for Dark Times and order the 180g 2 LP version! I will admit that I hadn’t been following him at all. There was a friend of a friend in Minneapolis who, in the 90’s, was a big Ben Harper fan and had seen him a couple of times at First Avenue– he tried one night to get me to listen to some songs. At the time I wasn’t really very taken with what he played for me and I guess that stuck with me until I saw these songs in the movie. 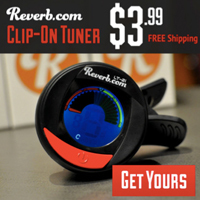 I was immediately taken with the slide guitar parts. Apparently the creation of the Relentless7 band sparked a new direction for Ben Harper– one that I think has some genuine soul and blues to it. I recommend catching him live with his new band. Finally, Dave Matthews Band was up and played nine songs from their Austin City Limits Festival set. I was a fan of the first two Dave Matthews Band albums– especially Under the Table and Dreaming which was played on Rev105 and Cities97. I really hadn’t heard anything quite like them at the time– the passionate, slightly soft vocal delivery from Dave Matthews and the overall polish that really helped deliver the songs. Like many, I heard all of the huge singles– “Crash Into Me,” “The Space Between.” I just didn’t really keep following him because I didn’t feel that he really developed much over the years. It isn’t that I don’t like Dave Matthews, I’m just not really compelled to listen to him much–in my opinion he just hasn’t developed based on his studio output. Where Dave really shines is in a live setting. He has one of the great live bands, really– strong and able to really carry the show, I think. I wasn’t very familiar with most of the songs in the movie, except for the “Burning Down the House” Talking Heads cover, “Ants Marching,” and I had heard “Why I Am” from the new album. None of the big hits were in this set which seemed to focus on his new album Big Whiskey and the GrooGrux King, which is a tribute to the late DMB member LeRoi Moore. But, it is the live performance where he shines and he was clearly working for this performance– his shirt was soaked with sweat, and he was in constant movement, clearly enjoying the music often with a big grin on his face and doing his little shuffle dance. After the DMB set, during the credits we got to see one more performance from Gogol Bordello– “Wanderlust King” which was cool. Effectively, then both of the opening acts got three songs. Looking around the empty theater I wondered if the show would have been more enjoyable with others in the audience. I expect it would have been– but traditional movie courtesy is to be quiet during movies– are the crowds more participatory during these live concerts– do they cheer? Maybe I’ll find out in February at the Lollapalooza movie if they have it in Cedar Rapids. The Time to play b-sides archives for the dave-matthews-band tag.